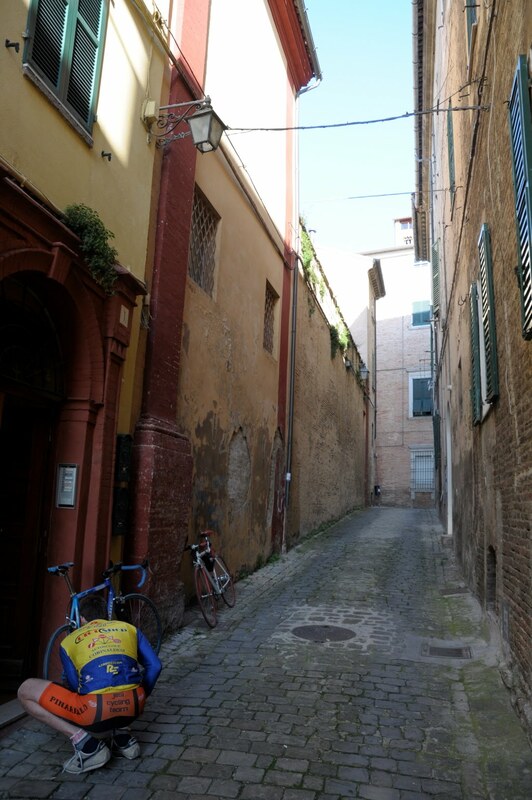 Spring was very much in the air in Jesi so Ali and I decided to go for a Sunday morning bike ride. We pulled out the bikes and got ready in the street outside Ali's apartment. I pumped up the tires on the bike I would be riding (thanks Corinne), tightened up the laces on my Supras (these shoes do it all), lathered on the sunscreen (my thighs hadn't seen the sun in a long, long time), and hoped that I still knew how to climb. 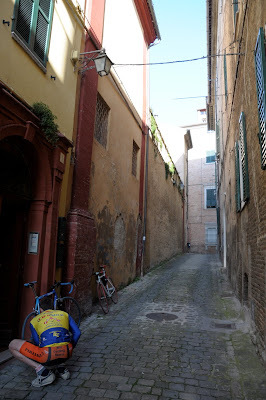 We set out to conquer i Castelli di Jesi, or the Castles of Jesi. 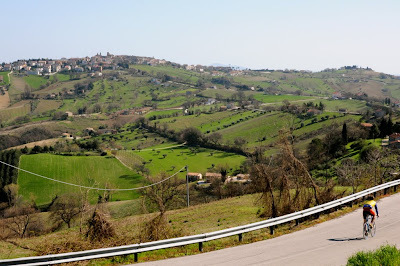 The ride would take us through a number of local hilltop towns with impressive castles that once belonged to the noble landowners of the area. Between the towns the countryside was filled with farms, rich with color from several weeks of heavy rain. Ali led the way to the last the last town on our tour, which I believe was Costa, and can be seen on the distant ridge. This map shows our approximate journey, though I must admit that it took us slightly longer than Google seems to think it should. It was great to be back on the bike and get excited for some stateside riding when the snow begins to fade.